Supplies: Orange Card Blank 5 !/4" X 7 1/4" Halcraft, Papers: Stampin Up: Whisper White, all others from my stash, Stamps: Stampology Autumn Leaves: Wellies and Brellas, CTMH: B1054 What a Great Day, Inkadinkado: Round Frames, Special Thoughts, Ink: CTMH: Z2155 Topiary, Whispers: Butterscotch, VersaMark Ink pad, Sharpie yellow marker, Stampin Up: ticket punch, The Robin's Nest: dew drops, ribbon: Offray, Karen Foster: big time brads, pop dots. This is a beauty, lovely colors!!! Thanks so much for joining us at Saturday Spotlight! 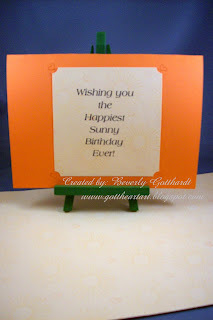 Bev, really adorable card, love the bright colors...good luck in the challenge this week at Saturday Spotlight..
Nice card! !Thanks for playing along with my flutter by challenge! Bev this is perfect for the masterboard challenge.. Thanks for joining us this week. This is such a pretty card. I love the soft subtle colors and your design!! Great job on this week's challenge. Thanks for playing with us at the SSHP this week!! 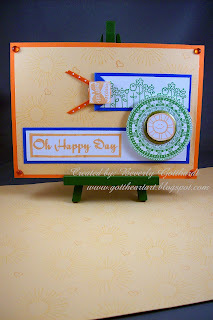 Fun color combos and images on this card! Thanks for playing in this week's Saturday Spotlight challenge! !